Does anyone know what the opposite of The City of Light is? Whatever it is, I think that’s where we were all taken in this week’s episode of The 100, and we didn’t even take a pill to get there. Because if the City of Light represents a place free of pain and worries, this week’s episode couldn’t be further from that. 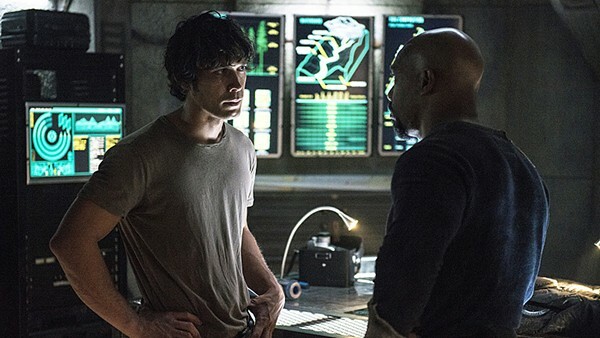 Between continued character assassination for Bellamy and the return of Jaha, the whole episode was kind of a mess and with each minute that passed, I got more and more frustrated with the show. Remember back in season one when Bellamy was a pretty awful person, and thought that torturing Grounders, like Lincoln, was the only way to survive? The whole time he was doing what he thought was right for the people but his methods were less than praiseworthy. He did not view them as humans and treated them as such. Then, because of Octavia and Clarke and the relationships they started forming with the Grounders, he slowly came to realize that they are not all bad. Just like him, they are human and are simply doing what it takes to survive. Apparently that’s a lesson Bellamy completely forgot in the course of two episodes, as the Ice Nation attack on Mount Weather erased all that character growth, reverting him back into the exact same person he was when the series started. Ignore the fact that there is clearly a difference between Ice Nation and the rest of the Grounders, ignore the fact that the Grounders were actually trying to protect the Sky People, and ignore the fact that he has formed relationships and bonds with Grounders like Lincoln and Indra. Ice Nation attacked Mount Weather and even though this caused the rest of the Grounders to declare war on Ice Nation, Bellamy still feels that they should all be punished. So... pretty much the exact opposite of everything he has learned throughout the show. His conversation with Clarke was a frustrating one, as the writers tried to give some explanation for what he’s doing. But the Bellamy we have all come to love would never turn on a dime like he has, regressing to the point that he’s no longer recognizable. The moment where he finally seems to accept what Clarke is saying, only to get close to her and handcuff her so that he could take her in, was truly a heartbreaking moment and the final dagger in showing that he has truly lost all semblance of who he had become. Every character has been affected and has reacted in different ways to the tragedies that have occurred, but few of them have agreed to take part in such a disgusting massacre of innocent people as Bellamy has. Is he even any better than Finn was at this point? His only saving grace was that he let Indra live but even that goodwill was erased when he helped force Lincoln and the injured Grounders out of their camp. Listen, I get what the writers are trying to do with all of this. They needed some kind of conflict this season and they could not just bring in another new group that Sky People somehow hadn’t encountered before. The only option they saw ahead of them was putting Sky People back at battle with the Grounders. And that might have even been okay, if they didn’t have Bellamy supporting the insanity. As awful as a person as Pike is, there’s at least some logic and reason to why he is so against the Grounders: he has only ever seen the bad side of them. Nevertheless, as someone who knows how good some Grounders are, there is no excuse for Bellamy’s actions. Elsewhere in "why is this happening?" land, we also saw the return of Jaha to his people. Convinced that the only way to get Sky People to join him in the City of Light was to get Raven on board, he set his sights on her. Overall, Raven has been one of the best parts of this season, remaining strong and not taking crap from anyone despite her injury. For most of this episode, she kept that strength up, telling Jaha exactly what she thought of everyone trying to help her and take the pain away. In a moment of weakness though, she took the pill he gave her and opened up the door for more disappointment from this show. Taking one of the only likable characters left and throwing them into the weakest plot was not exactly the best idea, and I can only hope that somehow Raven will be able to resist the effects of the City of Light. The only kind of good thing The 100 has going for it right now has to do with the Grounders and Clarke’s involvement with them. After seasons of fighting, it was nice to temporarily see both groups working together toward peace. As Clarke so aptly pointed out in the episode, the only way to truly achieve the peace both sides want is for someone to finally put a stop to the cycle of violence. Most of the Sky People are too busy regressing and thinking illogically to ever make this first step but thankfully, Clarke was able to convince Lexa. With each episode that passes, I get more on board with whatever is going on between them. Because right now, regardless of what has gone down between them in the past, they are both encouraging each other to be better people, and that is more than anyone else on the show is really doing at this point.